Hi guys! I have the KBShimmer Spring collection to show you today thanks to the amazing Katie from Harlow&Co! There are actually so many of them that I decided to split the review in 2 so just the cremes for now but the glitters and holos will follow very shortly! Formula was utterly fantastic on all of these, even the yellow! Perfect consistency, lots of control an buttery smooth, I used 2 easy coats in all of swatches below but I could have gotten away with just one on the darkest shades. My Life’s Porpoise is a pale blue based grey. I really love it and would definitely see myself wearing it all year long. 2 coats are shown here. A Touch Of Glass is pastel aqua with a secret shimmer. Another beautiful color, very versatile, leaning more toward green or blue depending on the lighting or your skintone. I used 2 coats. Sky Jinks is a bright sky blue with a touch of dustiness. Very pigmented, this one could easily be a 1 coater with careful application. I used 2 coats plus topcoat. Honeydew List is a muted yellow based green pastel. I don't think I have many greens like this one. 2 coats plus topcoat shown here. Chick Me Out is a vibrant sunny yellow. Typically the kind of yellow that would be a nightmare to apply but not on this one! You're looking at 2 coats plus topcoat. Life Rose On is a bright pink with strong purple undertones. If you're not a pink person, this one is cool enough to make you change your mind. Highly pigmented, the second coat was barely necessary. Pansy-Monium is a medium purple creme with red undertones, a beautiful color and a dream to apply. Again, I used 2 coats plus topcoat. And finally Eclipse is a pure jet black creme, fantastic formula, application, finish. Pigmentation was amazing and I could have easily gotten away with just 1 coat if my nails had been shorter. Shown below 2 coats plus topcoat. Cremes aren't typically what you would expect from an indie brand but these were all so perfectly formulated and make such nice undies for glitters and nail art that I ended up really loving them. Stay tuned for the second part, the glitters and holos! 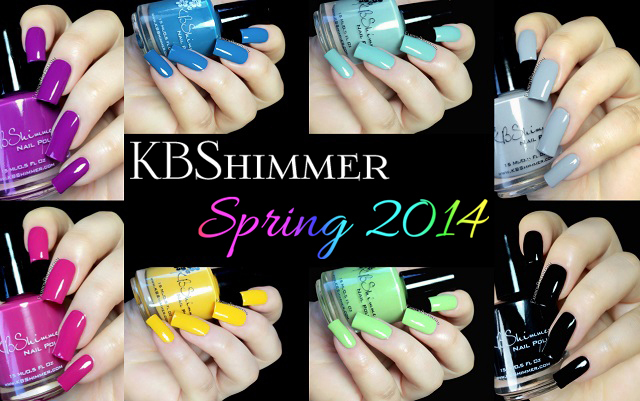 The KBShimmer Spring 2014 Collection can be purchased on KBShimmer.com (US only) and Harlow&Co (international).